Like Madden or the inevitable movie tie-ins, LEGO games are starting to be more commonplace, leaving no license safe from their blocky heads and stackable bodies. If it's popular, it will be made into a LEGO game. This leads us to the latest game in the series, LEGO Pirates of the Caribbean for the Nintendo DS. Another year, another Kingdom Hearts title. This time, however, it’s another Re title: �Re:Coded.� This entry in the Kingdom Hearts saga is unique in that it started off as a cellphone game in Japan and was a couple of years later ported to the DS. With no Kingdom Hearts 3 on the horizon and Kingdom Hearts 3D: Dream, Drop, Distance coming soon for the 3DS, can Re:Coded satisfy fans until then? Part Zelda, part Final Fantasy with a dash of Pokemon, Golden Sun is still one of the best RPG series of the last 10 years. At E3, I tried out Ghost Trick: Phantom Detective, and it didn't leave a great impression on me. Will the full game change my mind? If there is such a thing as "un-jumping the shark" Sonic the Hedgehog just might be doing it. Earlier this year, Sega released Sonic The Hedgehog 4: Episode 1, which took the series back to its 2-D roots. Episode 1 was a good game, but it played it safe and didn’t experiment with the formula any. Sonic Colors, on the other hand, tries something different by giving Sonic some new color-based powers. In a land far away, a mysterious crystal calls on four "Heroes of Light" to venture out into the world to stop an evil that is plaguing the land and its inhabitants. Sound familiar? It should, because that was the basis of Square’s first RPG: Final Fantasy. It is also the basis of Square-Enix’s latest game: Final Fantasy: The 4 Heroes of Light for the DS. Instead of a just a graphical face-lift, like previous iterations of the game, Square decided to start over. I say "start over" meaning: How would a Final Fantasy game be like if Square were a new company today? How would they use current technology to create a memorable game that gamers new to the series and to RPGs in general could get into? Beat City is like most of the rhythm games out there...except without the licensed music. Tetris is one of those games that no matter who you talk with, usually the response is �Oh yeah, I love that game!� From the early GameBoy version to ones found on cell phones, everyone has played some form of Tetris. With Tetris Party Deluxe for the Nintendo DS, a whole new generation of gamers will be able to experience the addictiveness of the gameplay for themselves. The survival horror genre is definitely lacking on the Nintendo DS. Good thing there's the Dementium series to freak you out while you're on the go. Dementium II does just that. A new strategy RPG from Ignition Entertainment, the latest in the Spectral Force series is similar to Dragon Force. Or is it? The popular and critically acclaimed Pokemon Gold and Silver have been re-released by Nintendo. Is this simply a way to make a quick buck or is it worth the purchase for fans of the series? From the creators of Hotel Dusk, Again is another detective tale. Too bad the similarities between the games stop there. Ace Attorney bad guy, Miles Edgeworth, gets a game of his own in Ace Attorney: Miles Edgeworth Investigations. 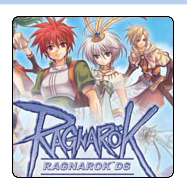 Ragnarok is a DS RPG based on the famous MMORPG. Does it transfer genres well? A JRPG tale of Greek Mythology.